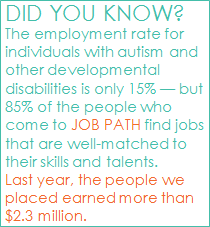 Job Path is deeply grateful for the generosity of our donors and partners. Everyone involved contributed in making this year’s gala another great success. There is a job for everyone. When he graduated in 1992, Eric Doughty was denied enrollment in a sheltered day program because he was deemed “too loud” and “too compulsive.” But his mother, Geri Smith, was just as glad because she believed her son could hold a job. So through a special project with his school, Job Path set out to prove her right. 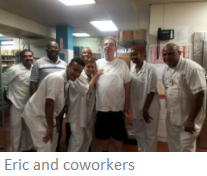 _Working as a dietary assistant three days a week–stacking and cleaning trays –Eric has been on time and in a clean uniform for 25 years. Now he lives in his own apartment, with help from his family and Job Path, especially Tracey Ramdehal, who has supported Eric for more than 14 years. At the Interagency Council, June 9th, Crecida Norris was recognized as one of the field’s “shining star” Direct Support Professionals. Crecida has been at Job Path since 2004. Every day since then she’s devoted herself to the people she supports. They’ve become shining stars, too, because of the thoughtful support she provides and the deeply caring relationships she’s developed with them and their families. As her supervisor Maureen Martinez says, “Crecida lives out the meaning of love.” Job Path truly appreciates her hard work and dedication. Giving Tuesday doesn’t have to be only once a year. Visit our Network For Good page and make giving a monthly event. As little as $5 per month makes a difference. Thanks to all who made our benefit an event extraordinaire! Some photos from our October 19, 2016 benefit. Job Path was awarded the top prize in the daily support category for CHIC: Changing Housing into Community. CHIC is a parent-initiated program that represents a partnership between Job Path, a group of parents and Adaptations, a social program at the JCC of Manhattan. CHIC offers the support of a group home without the group home. People have their own apartments but live near one another. Everyone has the personalized supports they need to manage their households and participate in community life. We are even creating an app, Pieced, that is designed to help people hire their own staff. Think Tinder meets Linked In. Our first CHIC community, which we call West Side Connections, is operating in New York City. Click here to watch a short video about CHIC and Pieced. West Side Connections has gone from the drawing board to reality: several young people are now in their own apartments. Director, Lauren Enos, manages the day-to-day details and helps connect the young people to one another and to community life. Did you miss our Art Heist? The event, held at the Brooklyn Brewery, featured art donated by artists and friends from Job Path. Click here to watch a short clip and we hope to see you next year!